Father Lazarus was born and raised in Southern California. He holds a Masters Degree in Clinical Psychology with an emphasis in Marriage and Family Therapy from Azusa Pacific University. Prior to his consecration and ordination, he worked as a journalist in Los Angeles, CA and as a Mental Health Clinician in Southern New Jersey and Philadelphia from 2001-2008. He previously served at St. George in Bellflower, CA from 2000-2004, St. Verena and the Three Holy Youth from 2004-2006 and St. Anthony in Medford, NJ from 2006-2008. 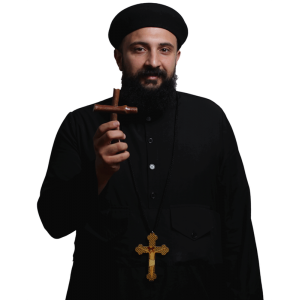 On November 2, 2008, he was ordained as a presbyter by His Grace Bishop Serapion and His Grace Bishop Youssef of the Diocese of the Southern United States to serve in the Diocese and assigned to St. Mina in Riverside and St. George Church in Bellflower. Most recently. His Eminence Metropolitan Serapion assigned him to serve at Christ the Good Shepherd Church in Long Beach.